That's it. The rest was a copy and paste of an article from NOAA (archived here). The NOAA article was about how there have been no tornadoes reported in the USA this March, so far. This is a record - since 1970 at any rate. Anthony Watts talked about a "meme", but what he wrote is a logical fallacy known as a strawman, as you'll see below. The NOAA article that Anthony copied and pasted is five days old. As you know, Anthony's not been about much at WUWT lately so you might think this was him catching up. But this is the second article in three days at WUWT (see here) about the NOAA press release on the lack of tornadoes, so it's more likely that Anthony isn't keeping track of his own blog. Will tornadoes increase with global warming? Maybe, maybe not. We're not even one quarter of the way through 2015 yet. I expect Anthony is getting in while he can. Thing is that the science is ambivalent about whether global warming will bring more or fewer tornadoes to the USA. It depends on more than just the energy in the atmosphere, it has to do with shear. Here is what is written in the latest IPCC report (AR5 WG1) (my paras and emphasis). Severe thunderstorms, associated with large hail, high winds, and tornadoes, are another example of extreme weather associated with the water cycle. The large-scale environments in which they occur are characterized by large Convective Available Potential Energy (CAPE) and deep tropospheric wind shear (Brooks et al., 2003; Brooks, 2009). Del Genio et al. (2007), Trapp et al. (2007; 2009), and Van Klooster and Roebber (2009) found a general increase in the energy and decrease in the shear terms from the late 20th century to the late 21st century over the United States using a variety of regional model simulations embedded in global-model SRES scenario simulations. The relative change between these two competing factors would tend to favour more environments that would support severe thunderstorms, providing storms are initiated. Trapp et al. (2009), for example, found an increase in favourable thunderstorm conditions for all regions of the United States east of the Rocky Mountains. Large variability in both the energy and shear terms means that statistical significance is not reached until late in the 21st century under high forcing scenarios. One way of assessing the possibility of a change in frequency of future thunderstorms is to look at historical records of observed tornado, hail, and wind occurrence with respect to the environmental conditions (Brooks, 2013). This indicates that an increase in the fraction of severe thunderstorms containing non-tornadic winds would be consistent with the model projections of increased energy and decreased shear, but there has not been enough research to make a firm conclusion regarding future changes in frequency or magnitude. So thunderstorms will probably increase in severity and frequency. Tornadoes may actually decrease. First of all, it is important to distinguish the meaning of weather from climate. Weather describes the conditions of the atmosphere at a certain place and time with reference to temperature, pressure, humidity, wind, and other key parameters (meteorological elements), the presence of clouds, precipitation, and the occurrence of special phenomena, such as thunderstorms, dust storms, tornados, etc. Climate in a narrow sense is usually defined as the average weather, or more rigorously, as the statistical description in terms of the mean and variability of relevant quantities over a period of time ranging from months to thousands or millions of years. The relevant quantities are most often surface variables such as temperature, precipitation and wind. The classical period for averaging these variables is 30 years, as defined by the World Meteorological Organization. Climate in a wider sense also includes not just the mean conditions, but also the associated statistics (frequency, magnitude, persistence, trends, etc. ), often combining parameters to describe phenomena such as droughts. Climate change refers to a change in the state of the climate that can be identified (e.g., by using statistical tests) by changes in the mean and/or the variability of its properties, and that persists for an extended period, typically decades or longer. Super Tropical Cyclone Pam which devastated Vanuatu - which Anthony didn't notice and mention at WUWT. (There was a sentence in an article by someone else, buried deep in an article about something else.) Below are pictures of the devasation - with more here on the ABC. Cyclone Olwyn - which devastated crops in WA and damaged a lot of buildings. Cyclone Nathan - which circled around and lashed Queensland as a Cat4 (with some towns spared the worst of it), then kept heading west over more sea to hit Nhulunbuy in the Northern Territory, where it's said to be the worst in living memory. Super Tropical Cyclone Marcia hit Queensland last month. Tropical Cyclone Lam hit the Northern Territory last month, devastating some smaller communities. 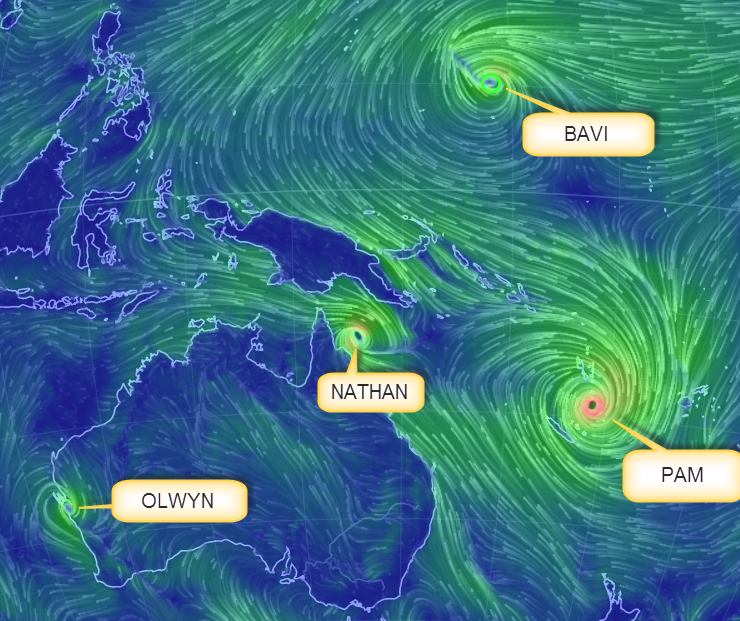 Four simultaneous cyclones, from Earth wind map annotated by me. 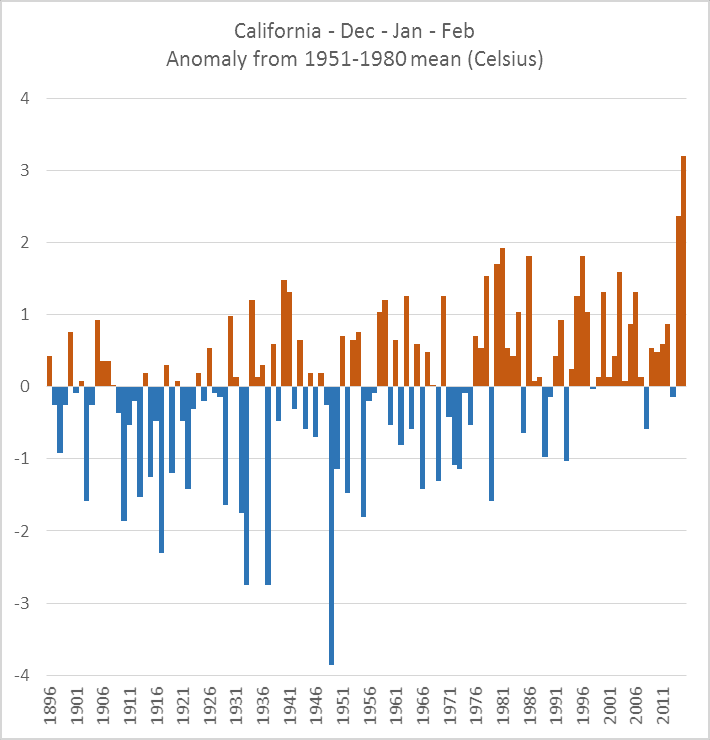 Anthony's own home state of California had its second-in-a-row warmest winter on record, and just this month heat records have been falling all across his own home state. Inland Alaska has been basking in unusually warm weather for this time of the year. The east coast of the USA had extreme snowfalls this year, Boston, in particular, hit the news. Storms and rain have battered places from Reykjavík to Ohio and from Brisbane to Tanzania and from Bolivia to Madascar and Malawi - leaving death, homelessness and destruction. Avalanches in Afghanistan killed almost 200 people. Again back to the USA where large areas, particularly Anthony Watts' home state of California, are still in the grip of a devastating drought. The city of Broken Hill in western New South Wales is faced with the prospect of running out of water, if nothing is done soon. As are some communities in Queensland. Some African nations are suffering severe drought, too. 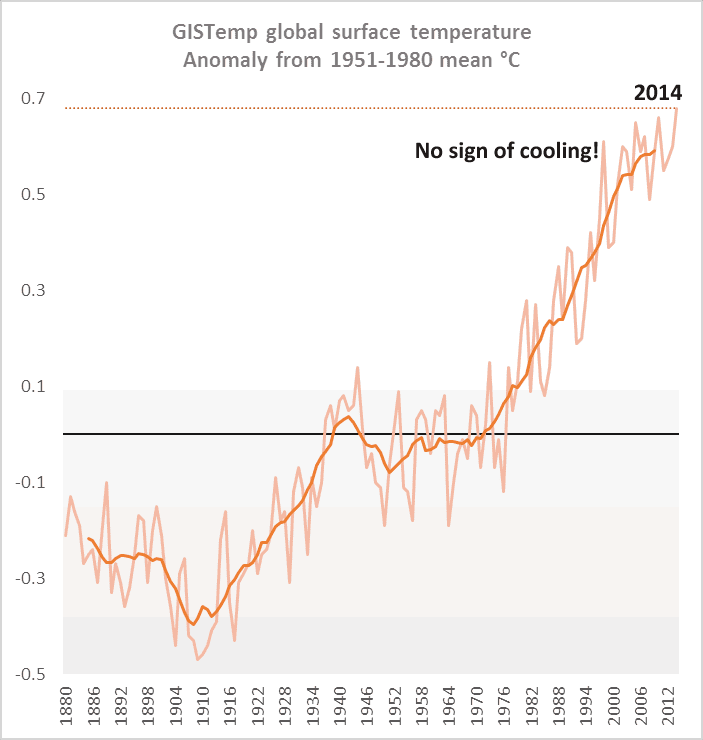 And don't forget that 2014 was the hottest year on record. January 2015 was the second hottest January on record, and February 2015 was the second hottest February on record. I could go on, but you probably get the picture. Extreme weather continues, unlike what the disinformers at WUWT will tell you. You might be asking if weather extremes are happening more often. Well, a few days ago I posted the Munich Re chart below, which suggests that they are. The chart shows loss events. This is not the same as insured losses - it includes all events that "either resulted in direct property damage and/or at least one fatality". The report is available here, but you'll need to register (it's free). The WUWT comments are pretty much as you'd expect. Denial mixed with paranoid conspiracy theories of the climate kind. There were also a couple of comments from people who thought Anthony was drawing a long bow. The definition guy would have as little clue about what is expected with climate change as Anthony Watts. I don't know that anyone has predicted an increase in tornadoes (see above). It's a denier strawman. You have to admit, being wrong with every prediction you make would be as tough as actually getting them right. To maintain a 100% failure level has got to be extremely difficult. When you consider that many of the predictions were 50/50 propositions, maintaining that level of incompetence would be very, very difficult to maintain. Hats off the the IPCC for proving that while absolute failure may indeed be extraordinarily difficult, it is not impossible. I better go now. They’ve predicted a huge ice storm. I’m off to buy some sunscreen, beer, an ice chest and beach towels. Its good to be prepared. That level of failure is truly remarkable. I’ve mentioned that before that it would be almost impossible to predict anything 100% with a 50 – 50 probability. Pulling all the red marbles out when they should be white or flipping the coin and getting tails when you are predicting heads. What’s even more amazing that they are using science to predict those outcomes. They’d be better off breaking bones to see which way it cracks. They’d at least get a few right. hunter doesn't bother to keep up with weather news. It would put too big a dent in his denial. Of course the reality that every year is bad for the CO2 causes more dangerous weather mean is lost on the climate kooks. cjames says he's as big a denier as the best of them at WUWT, but finds Anthony's take on the NOAA article trite and maybe premature. I am as opposed to all the alarmism and bad information about this subject as anyone but I must say I do not understand the point of this post. As SPC states “Analysis of the ten lowest and ten highest watch count years through the middle of March reveals little correlation to the subsequent number of tornadoes through the end of June.” The lack of severe thunderstorms so far this year is just weather and it is certainly not unprecedented. In 1981 we went almost 100 straight days without a severe weather watch being issued and so far this year we are only at 51. It also looks possible that we will see quite an uptick in severe thunderstorms in April and May. Joe Bastardi is already hitting this forecast quite hard. Should that happen, I think the comment that “this being a bad year for severe weather caused by climate change” will look rather silly. Aran sides with cjames. He also claims to have seen "useful" articles at WUWT. I wonder when that was? Surely you’re not considering that looking at a period of less than 3 months can hold any significance at all regarding long-term phenomena such as climate? This is like trying to watch the stars through a microscope. All you see is noise. I have seen some thorough and useful articles on this site, but this one is certainly not one of them. It’s important to report “abnormally” benign weather phenomenon to counter the warmunists’ 35-yr propaganda campaign of hyping any “extreme” weather event that takes place anywhere in the world. The public must be made aware of warmunists’ distortion of reality (aka as lies) for science to “win” the propaganda battle. CAGW is no longer about science, it’s devolved into a political propaganda battle, which the Left is starting to lose by attrition. I guess the CA drought no longer counts as 'extreme weather' because, now its in its 3rd year, to a minnow with no long term memory it is the new normal. Yes, I think that will happen more and more, Millicent. 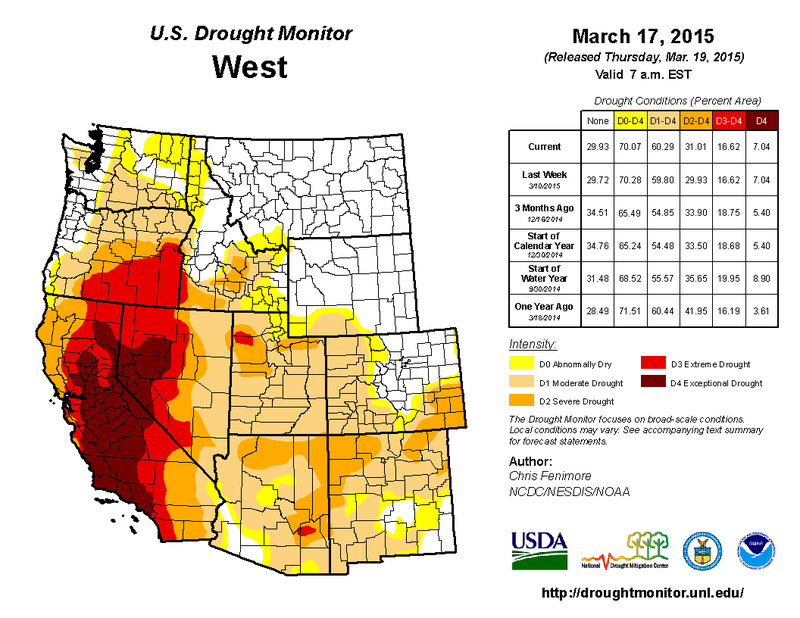 The California drought is in it's 4th year now. Well I'm sure that Anthony will be writing an article to correct his oversight. After all, the signs are becoming far too obvious for anybody with a connection to reality. Unless, of course, even the snow has been misled by adjustments to temperature data. "So thunderstorms will probably increase in severity and frequency. Tornadoes may actually decrease." The NOAA article does say "...this March has been unusually quiet, with no tornado or severe thunderstorm watches issued..."
Samurai's comment above stating that the warmunists "campaign of hyping any “extreme” weather event that takes place anywhere in the world" does not equate in any way to denialists hyping any calm interlude in the world into proof that there are no extreme weather events! Has Anthony written anything about California's drought? "...Anthony's 'never before' only goes back to 1970." Not many tornadoes in January, and even fewer in February (2). The only other early March without tornadoes was 1969. But good US records only go back to 1950. Anthony should be careful about touting the 'other extreme' of Extreme Weather - when there isn't any. (Ignoring magnitude) Mankind would obviously benefit from periods of much reduced tornado, or hurricane (due to wind shear), frequency. However in so far as this is new, even if occasional, it might indicate a change in the climate - which is climate change. And fence sitters will realize that even if occasionally beneficial, it is still a symptom of AGW. Apoligies for going off topic again - one day I'll write something that is thread relevant - but ya gotta read this. and blames Al Gore for this omission. The only thing standing out is the northwest pacific, however this is not considered "abnormal" as the northwest pacific typhoon season goes "year round", it can brew early storms. i do follow up on tropical cyclones and honestly spoken since 2008 it got actually "very quiet" Global ACE and global counts do actually support this quietness. Attempting to 'measure' Global Warming by stochastic phenomena is cherry picking of the highest order. It is hard enough to measure the temperature rise globally in the air and oceans with all the noise of ocean oscillations, aerosols and volcanoes. That is why a thirty year period is chosen to reflect climate and not weather. These deniers are morons. A certain Anthony is in a state with record drought and a few hundred miles away to his East they are having record wet snowfalls. He then looks for tornadoes in a small time period while all this anomalous weather is happening and declares situation normal! Sou covered the complex science in her usual way.